Sterling silver 1/2" tag and 5/8" disc have been hammered around the perimeter giving them a beautiful depth and texture. Disc can hold approximately 6 characters, rectangle is cut to fit name so it will hold longer names. 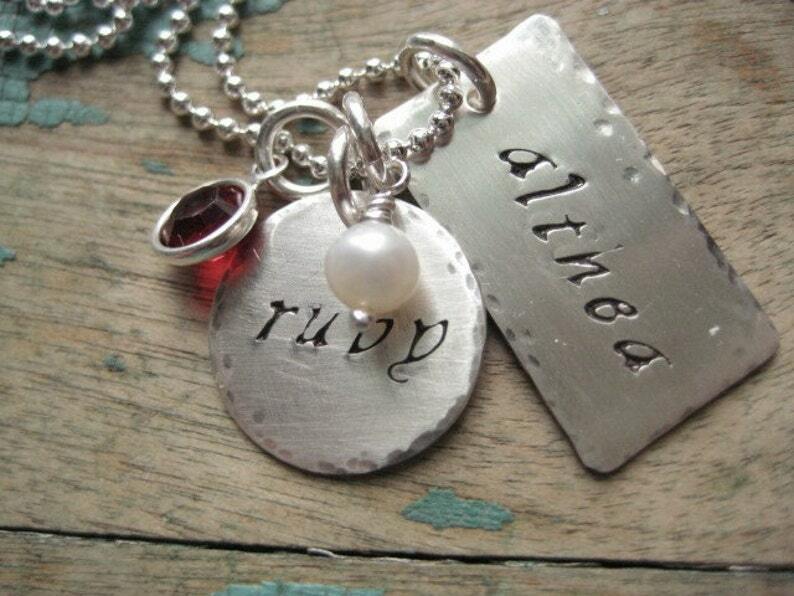 Birthstones and/or a pearl can be added . If choosing birthstones just let me know which month during the check out process in the "note to seller box"
The chain used is an 18" sterling silver ball chain. I also carry 16" and 20" if you prefer a different length. Exactly what I was looking for / came super fast. Would buy from again in a heartbeat. Thanks!!! Turned out great! The only reason why I didn't give it 5 stars is because I ordered one about 3 years ago and this one is a little longer. But I don't think my hubby minds. Love this necklace so much I ordered another one and fabulous customer service. I gladly accept Paypal, Money Order, Credit Cards (via Paypal, see this link for more information http://www.etsy.com/storque/how-to/how-to-pay-with-a-credit-card-and-create-a-paypal-account-746/), or personal check. I will begin work only after the payment is processed. I do not offer refunds on custom orders unless there is a misspelling. If there are other problems with the piece, please contact me and I will do my best to work something out. Please note, I will ship to the address listed in your Etsy account. After the payment is processed, please allow for up to 1 week to ship custom orders. All other pieces will ship within 2-3 business days. All packages are shipped USPS with confirmation only on US orders. Insurance can be purchased for an additional charge. Please contact me before sending payment to clarify the insurance rate. Not responsible for items lost or damaged during shipping.